This 8-book box set contains Finn Family Moomintroll, Comet in Moominland, The Exploits of Moominpappa, Moominsummer Madness, Moominland Midwinter, Tales from Moominvalley, Moominpappa at Sea, and Moominvalley in November.. There is also an earlier 5-book version of this box set. 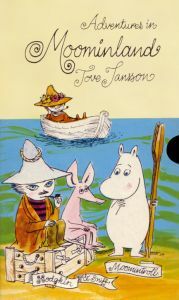 The two editions have generally the same front and rear design, but an intriguing difference is that the 5-book version incorrectly labels the seated figure as "Snufkin", while the 8-book version corrects this to "Hodgkin".